If you're like me, you've had one too many mushy boiled brussel sprout dishes. I don't know how many times I've shown up for Christmas dinner and dreaded the passing around of the brussel sprouts. I too am guilty of butchering the poor little cabbage heads though because I didn't really know of any other way to make them. However, as many times as I've had to endure the mush, I always wanted to like them. I'll need you to trust me here. Roasting the brussel sprouts takes them to a whole new level and it's a delicious place to be. They become nutty and crisp on the outside and tender on the inside. I'll be making extra this year for Christmas dinner in hopes of having leftovers. Yes, I actually just said that about brussel sprouts. Happy Holidays!!! 1. Preheat oven to 400 degrees. Peel the first couple of leaves from the brussel sprouts and trim off the rough bottom stems. 2. Place the brussel sprouts in a large baking dish so they are in a single layer. Drizzle with olive oil and salt and pepper. Toss to coat. Dot the brussel sprouts with butter and place the dish in the oven. 3. Roast for 30 minutes (or until fork tender) tossing with a spatula every 15 minutes. Remove from oven and serve. 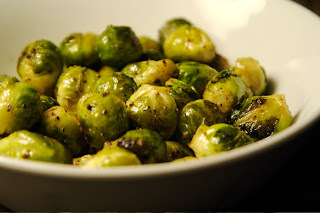 I have never been a fan of brussel sprouts, but I have never tried them roasted. Sounds like it would solve all the reasons I don't like them. I love brussel sprouts, but if they are overcooked, they are not my favorite. I can't wait to try these. I made some for a friend of mine by boiling them for about 3-5 minutes and then pan searing them in some oil with salt and pepper to taste. I'm also in hog heaven with your site. It's like my holy grail of online recipes, and so many of them seem so easy and inexpensive! Thanks!!!!! Brussel Sprouts are one of my husband's favorite vegetables but I have always struggled cooking them just right. I think I am going to put this on my menu for next week and see if I can impress him. Kudos to your husband for liking brussel sprouts, Laura! Let me know how it goes. Never thought about roasting brussels sprouts, but why not? And the touch of butter should be yummy! Will try it tomorrow :-). Love your website, glad I found it!